We’re bursting with pride to announce that The Savoy are offering a special The Tiger Who Came to Tea afternoon tea. 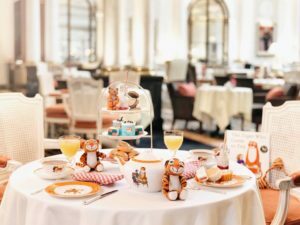 Celebrating the 50th anniversary of Judith Kerr’s much loved book, this is the first children’s Afternoon Tea to be offered at The Savoy and features yummy treats inspired by the tea Sophie and her mummy shared with the tiger including tiger stripe scones and special tiger food! Find our more, or book a table here.